With our Executive Package, we offer the highest quality State of the Art Basecoat / Clearcoat Service available. We use a variety of paints depending on the application for service in request. Our experience in working with all brands of high-end paints has helped us to decide which brands work better with certain applications. 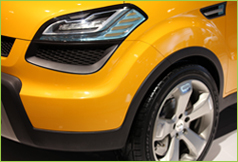 We use “Diamont Series Automotive Paints, DuPont’s Chroma Premier (Pro) System and PPG. These paints are on the absolute cutting edge of advanced technology for protection and over-all aesthetics. This package will exceed far beyond factory OEM standards and will be backed by a 5 year warrenty! The warranty for this package is set in place by our text-book method of prep work procedures. For questions or concerns on these procedures, please call or fill out our "request for information" form found on our contact us page. A brief description of these methods are listed below. NOTE: The prices below are based on vehicles in need of a refinish due to any type of paint failure or paint defects under the sun because the vehicle will be stripped of all previous coatings. Of course, vehicles in need of bodywork such as large dents or collision repairs are not included in this package. ( a limited number of small dents requiring body filler may be included upon request and inspection ) For more information about this package, feel free to fill out our "request for information form" found on our contact us page. All labor and material needed for this package are included in the prices below except for the basecoat. Basecoat varies in price so drastically depending on the tints and toners within the color of choice, making it impossible to predict the price so that we can include it into the pricing below. Door and trunk jambs are included in this package. We will also include the upgrade to a high solids clearcoat for added UV protection, maximum durability and a show car shine. The full overall paint job will take up to 2 weeks to complete depending on the level of prep work involved. After the entire vehicle is complete, it will then take about 72 hours to cure enough for regular use. A “5 Year Warranty” will be granted in this Package. 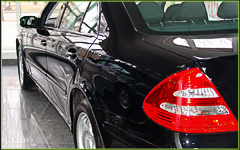 We perform minor bodywork to vehicles such as scratch and dent repairs. We also provide limited rust treatment and prevention for most existing rust problems. However we can not guarantee 100% complete rust elimination. (Rust has an acute behavior. If applicable extensive procedures for rust elimination get be performed with a guarantee for an additional cost. Please contact us for questions about rust.). We can also refurbish and repaint most damaged bumpers… Please see Add – On Services for spot repair prices.